OK, so J.K. Rowling’s first book after Harry Potter, The Casual Vacancy, didn’t get great reviews. Was that because everyone expected waaaaay more out of her than they should have? I’ll admit I have the book, but I still haven’t read it due to a combination of a “meh” public and a large TBR stack. So, as a result, who can blame her for publishing her second book, The Cuckoo’s Calling, under a pseudonym? Even though it was figured out pretty quickly, I am thinking she probably should have done this with TCV as well. I have to say right off that I really like her second foray into adult books. She has created some vivid characters who have their flaws. And everyone knows that it is those flaws make the characters. If you are into detectives who are former military, just broke up with a long-time girlfriend, living (temporarily) out of the office and having one less limb than is usual, Cormoran Strike is your man. He also has a few things that he would prefer you not talk about, but they are juicy enough to keep tongues wagging. Throw in a temp who is newly engaged (to a man who sounds like a bit of a wet dishrag), someone who is much smarter than the average admin and always wanted to be a private investigator, and you have the beginnings of what could be a great series. Wotsit About, Then? : The story revolves around the apparent suicide of a famous (infamous, really) model, Lula Landry, who was the adopted mixed-race child of a very wealthy British couple. Her biological mother is a piece of work, the father unknown. One of her brothers died when quite young, and the remaining older brother is very concerned with the welfare of Lula. It is this eldest brother, John Bristow, who in no way believes the official decision by the police that Lula’s death was a suicide. With all evidence pointing toward suicide, what drives Cormoran to take the case? And what makes him think he can prove the police wrong? Anything Else to Mention? : There is a lot going on in this book. Just like Harry Potter, the characters are so vividly drawn that you can see them sitting next to you as you read. They are three-dimensional, real people who, like normal people, have a lot going on in their lives. Ms. Rowling reveals all of this information in just the right amounts, weaving the backgrounds and personalities of the characters into the detective part of the story so deftly. I love that you don’t know what information is “important” and which is merely interesting. It is done so perfectly that the story feels rich and satisfying. You can’t ever gorge on or overeat her prose; it is always just enough. To Read or Not To Read: Absolutely read it. It’s calling. 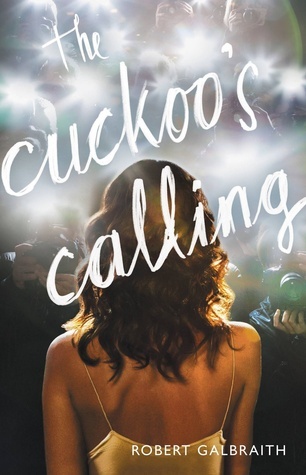 The Cuckoo’s Calling by Robert Galbraith was published April 30, 2013 by Mulholland Books. Ink and Page picked this book up from the library, so no one had a choice about whether it was reviewed. Previous PostWeekend Reads 10.4.2013: ‘The Cuckoo’s Calling’ by Robert GalbraithNext PostBriefINK/INKlings Interview: Gigi Levangie, Author of ‘Seven Deadlies,’ Talks Gluttony!